Eating Made for Our Pleasure! How Long Would It Have To Be? For those who believe the human body is the result of a series of random accidents, consider its amazing digestive system. The products that the earth grows (fruits and vegetables) are exactly what our bodies need for fuel, cell growth, and energy storage. The nose overhangs the mouth so that aromas will add pleasure and flavor to the eating process. The mouth contains lips that allow us to chew with our mouths’ closed. They contain 32 teeth that bite, tear, crush and grind our food and a tongue that senses flavor and pushes the food under our molars without itself getting chewed (most of the time). Our mouth also contains three saliva glands that produce a quart of the starch digesting chemical a day and help to wash the food down. The esophagus is a 10 inch tube containing a series of muscles that contract in rhythm called peristaltic waves, forcing the food to the stomach, even if we are upside down! At the end of it is a valve to close off the stomach so that digesting food will not be forced back up. The stomach contains 35 million digestive juice glands that begin to break down the complex protein molecules of the food into amino acids. A series of muscles in the stomach churn the food so that it is mixed with the acid, yet the acid does not digest the stomach! Then the ring muscles in the stomach begin a series of peristaltic contractions of their own so that every 20 seconds they force some of the chyme (partly digested food) into the small intestine. Were it not for the small intestine, we would starve because at this point only simple sugars and a few starches are ready for use by the body. The small intestine is 23 feet long and 1 inch in diameter. It too contains muscles that not only keep the chyme moving in one direction, but also turn it three ways so that the chemicals added mix into the chyme and the digested molecules are absorbed into the blood stream. At the beginning of this trip, three additional fluids are added to the chyme. 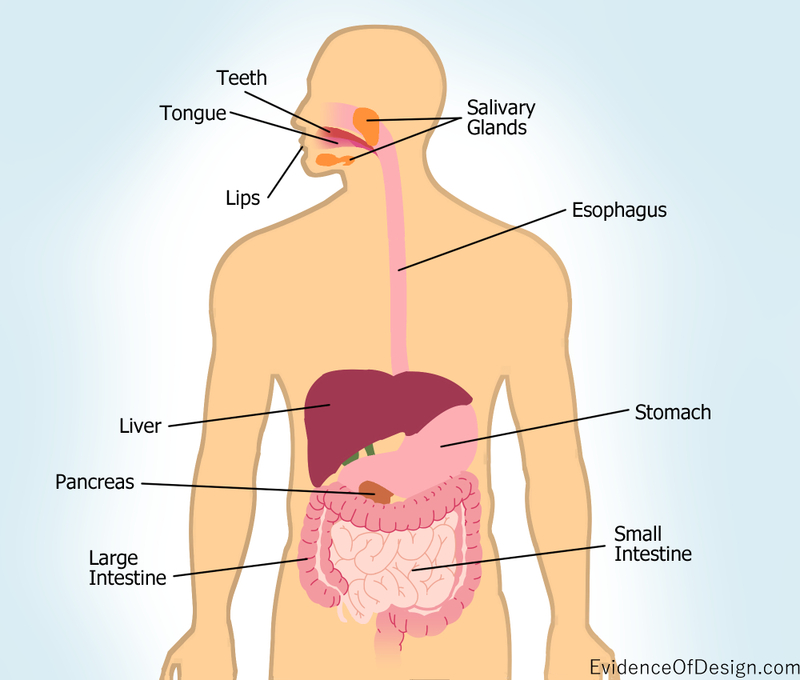 The pancreas adds pancreatic juice that breaks down fats, carbohydrates, and proteins. A pint of bile from the liver (stored in the gall bladder) breaks down fatty substances. The small intestine itself produces intestinal juice that helps with final digestion of carbohydrates, fats, and proteins. A total of 3 quarts of these enzymes are produced each day. The small intestine is around 20 feet in length and contains many ridges and fingers (called villi) to absorb the nutrition chemicals. If instead the small intestine was smooth, it would have to be 600 times longer to accomplish the same task! The large intestine is 5-6 feet long and 2.5 inches in diameter and, among other things, reabsorbs 2 gallons of fluids into the body to avoid dehydration. Question: what are the chances that all this perfectly engineered system came about by accident? How would man survive during the long process of small random changes that ended up with the present system? Like so many things in nature, it had to be fully functioning from the beginning. It is far easier to believe an intelligent Creator designed and made it for our good. And He wants to deliver you from a far greater problem than starvation, the problem of sin. It blows me away that people believe in evolution when you look at the design of everything. The whole universe is designed on higher mathmatics. I have gastritis problem, very lower digestion power. Sometimes gas forms so much that effects my whole system severely. My weight has been redueced from 64 kgs. to 45 kgs. I have weakness and could not walk even 1 km distance. Many treatments has been taken, but stiil no such improvement has been acieved.